Data source: Narcotics Division, Security Bureau, HKSAR Government. 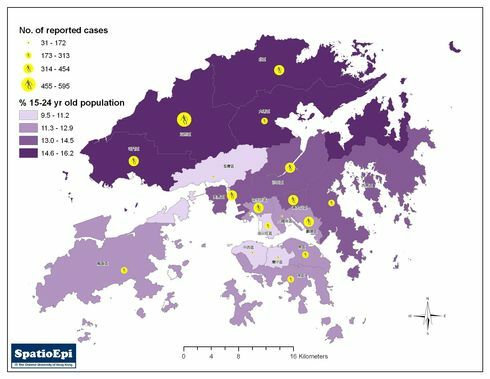 Map shows the district distribution of ketamine users (yellow balloons) reported to the Central Registry of Drug Abuse (CRDA) in Hong Kong for the year 2008, against the proportion of the 15-24 year old population in the respective district. The ketamine users and population data were displayed by classification in equal intervals on the map. Compared to Hong Kong Island and Kowloon, the New Territories (NT) accounted for a higher proportion of the 15-24 year olds. More ketamine users were recorded in the same districts with higher percentages of youngsters. Yuen Long District in NT reported the highest number of ketamine users , 595, followed by Kwai Tsing, 442 and Northern district, 440. Ketamine use is clearly a problem of the young generation. Statistics of the Narcotics Division have shown that the majority of ketamine users were under 21. Ketamine is available in powder, liquid, and tablet forms. In medicine it is used as an anaesthetic injected intravenously or intramuscularly. Ketamine has been approved for both human and animal use in medical settings back in the 60s. Ketamine is increasingly popular among young people since it is relatively cheap, compared to other abused drugs. It can be smoked, insufflated (snorting) or taken orally in tablets. Ketamine use can lead to hallucinatory effect though very often this is short-lived. Higher doses can cause "K-hole", a state of dissociation, while overdose can result in fatal respiratory complications. Ketamine users can become psychologically dependent and thus addicted. Other adverse effects of ketamine include hypertension and other cardiovascular complications. Chronic use of ketamine can also lead to severe cognitive impairment and kidney damages.